First screenshots of Kortes, Nady, and Teokhuga. The latest set of Atelier Shallie: Alchemists of the Dusk Sea screenshots and information detail the three characters introduced earlier this week in magazines, as well as new gameplay mechanics. Find the new information below. A protective sailor who only lives in the here and now. A friend of Shallistera’s dating back to their childhood, Kortes is a young man who functions as her protector. Affable and quick on his feet, Shallistera sees him like an older brother that she can depend on. Coming from a family of warriors who serve to protect ships, he learned martial arts since he was a young child. After living in Strard for a stretch and seeing how modern it and other places were compared to his home village, as well as bearing witness to alchemy, he harbors doubts toward his family’s customs that are bound by traditions. A mother who trusts her daughter more than anyone else. A woman whose thinking is hard to readily grasp, Nady is Shallote’s mother and in another life used to do some work for a firm in Stard. After meeting her husband, who came from another town, the two have Shallote, resulting in Nady decided to stop working. Since her husband’s sudden death, she’s raised Shallote on her own as a single mother. While she still spends a lot of her time around the house, she also follows her daughter around once she she herself starts working. As such, she ends up calling on an old connection of hers to bring in some work again so she can support Shallote. But because she’s not well versed in alchemy, she tends to take up way more than she can handle. An opinionated, but supportive boatman. A man who comes from a family of shipbuilders and who continues to work in the trade himself, Teokhuga is an opinionated man. Trusted by his family patriarch, he takes up the mantle of tagging along with Shallistera as she goes off on her journey. Having taken care of Shallistera since she was an infant, she sees him like a proper family member. He manages his family’s treasured ships and knows much of the stories and legends that surround them. As players make their way through the game, the protagonists will have thoughts on how they want to go about their day that are known as “Life Tasks,” which manifest as thought bubbles in the upper-left portion of the screen. The contents of Life Tasks vary based on story progression and play style, changing in response to the player’s decisions about how they choose to spend their time. A player that spends a lot of time in the game battling, for instance, will see their Life Tasks become combat-oriented. Should the player choose not to engage in a given Life Task in favor of doing something else, though, the game will respond and provide another one that may be more in line with their current antics. The objectives of Life Tasks will therefore build upon whatever sort of activities the player is currently focusing on. A list of accumulated Life Tasks can also be viewed in the pause menu. 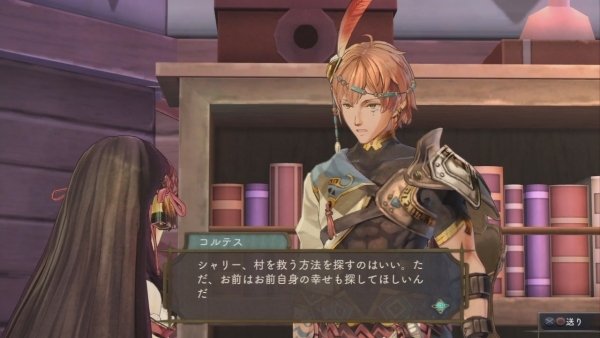 Fields in Atelier Shallie change in a number of ways in response to what the player does in them. By fulfilling Life Tasks, variables such as harvesting points, the items that can be acquired, and even the monsters that appear can change. Harvesting in particular also comes with its own share of events that can be triggered in the form of a gauge that fills up as more and more things are collected. When the gauge is at level 1 or higher, players can press one of the directions on the d-pad to trigger an event, which can include things such as an increase in harvested items, relic discoveries, and more. Additionally, the gauge has nine levels and its state persists for as long the protagonist doesn’t return to their atelier. Field exploration is also further bolstered by the presence of a minimap that displays information such as monster locations and entrances and exits, as well landmarks, which are points on the field that players can warp to as shortcuts during subsequent trips to fields upon finding them. As has been previously mentioned, Shallistera and Shallote have a number of activities that they can partake in while roaming around fields, with some of them exclusive to one character and others that can be done by both of them. Shallote, for instance, can clean and go fishing, both of which are pastimes that can yield items for her efforts, while similarly Shallistera can perform dowsing to find items of her own. Both of them can also go mining, which can not only help out with their harvesting efforts, but can also yield rare items. To better realize the unique tone and disposition that the development team is striving to portray in Atelier Shallie, outside musicians have been brought on board to collaborate on the soundtrack. Three artists have been announced as part of these efforts, Matryoshka, Nasu Asaco, and Canoue, with more to be shown at a later date. View anew set of screenshots at the gallery.